Driving to the civil affairs office, we notice the oddest things. Anna meeting her jie jies. Ethan is a card shark! Anna making her new fairies ride on her new doggie and finding that pretty funny! Our new family of eight. When we were leaving, Anna ran up to Nathan and yelled Baba! 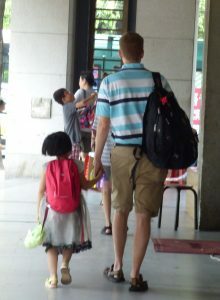 and took his hand – he teared up and so did I as I followed behind them. Ethan and Anna learned almost immediately how to play pile-on-the-daddy. She’s already in love with her new jie jies. Signing the official adoption papers. 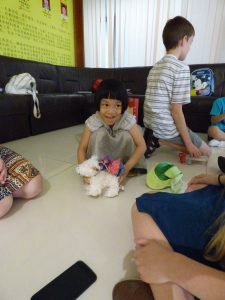 We got into Guangzhou mid-afternoon and were met by our guide, Helen. We caught an earlier train, so we had to wait a bit, and we are already noticing (and remembering) the difference between Hong Kong and mainland China. There is no English here except the occasional label (such as Female Toilet which always makes us laugh). 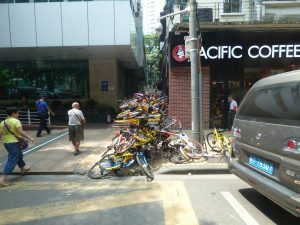 People stare at us a lot more, although it’s still not as bad as some of the places we were with Noah – Guangzhou is a more international city than most, so we are not quite as unusual, but we are definitely out of place here. I always feel so much more vulnerable when I’m illiterate. Nathan grabbed our return tickets with Helen and we headed out to the van. When adopting, you pay a guide and driver to get you where you need to go for the process, and to tell you what you’re signing, etc. Helen has been doing this for 30 years! She explained in the van that she was uncomfortable with our timeline as it left us no room for anything to go wrong, and asked if we were okay to make some changes to allow our medical clearances for the kids to be earlier. Of course, we want to do whatever is the safest plan to get our kids home, so we agreed. And we didn’t have to miss anything, we just have a few kind of crazy days followed by a few nothing kind of days. She got us checked into our hotel, and thanks to my brother for letting us use his points (and for my brother staying way too many nights in Marriotts so he has a crazy status!) we got an upgrade to a junior suite for one of our rooms. This is an amazing blessing because the rooms here are really small, but this give us an actual living space we can be in, and since we’re trying to save money everywhere we can, it gave us a place to eat in the room, etc. Checking in and at this point, all we’re thinking about is tomorrow. We’re trying to get everyone settled and I’m putting away the new kids’ clothes and putting together their backpacks for tomorrow, and it’s just there at every moment. How will it go? Will they cry a lot? Will they remember us from our WeChat conversation? Will they be happy? Excited? Scared? All of those? Will their health condition be what we are expecting? We will be adopting these children no matter what happens, but there are so many current unknowns that we will actually know tomorrow, that sometimes it’s stunning. We were thrilled to meet our friends, the Larsons, that night for dinner. They are in country adopting an almost 14 year old boy, Eddie. 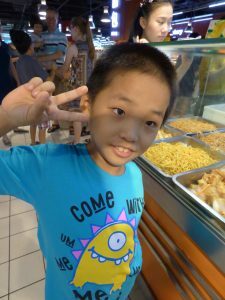 They are a week ahead of us in the process, but since all adoptions are finalized in Guangzhou which is where our kids live, we will get to meet Eddie and see them here! We walked down together to the restaurant we remember loving last year, and all I can say is, sadly, what a difference a year can make! The menu was completely different and pretty incomprehensible to us. And I would see something I thought looked maybe okay and Noah would tell me it was intestines or something. Sigh. But it was wonderful to meet Eddie and to see how well he is doing! It’s no joke to change countries and people and language at age 14, but he was just thrilled to have a family, and very brave about everything that’s changing. It was another great way to pass time, but getting ready for bed, we are all aware that this is our last night as a family of 6. The next morning Nathan, Rinnah, and I left early to head to the bank. There are caps on the amount of money people can change per passport, so we needed Rinnah because she’s over 18. We didn’t know this before we came, so thank goodness we had Rinnah with us! We had to pay pretty massive fees today, and all of them times two because we are adopting both Ethan and Anna, so without her here, we would not have been able to get enough. I thought this would be walking in and changing money. Maybe 20 minutes. But even though we were second in line, we waited an hour before we were even called. Then we were screened by a uniformed officer, asked a million questions yet again, had to supply all kinds of personal information, everything had to be sent to “central” to be cleared, whatever that means, and then all our US bills were checked one by one. Then we signed 6 different documents each, all while being very aware of the many cameras trained on us, and the fact that our guide had told us numerous times that we would be “watched very closely” to see how this money was spent. And finally they changed our money. Then Nathan went off with our guide to collect the money we had wired to ourselves as well, the last money we needed to pay all the fees, while Rinnah and I walked back to the hotel with a very, very uncomfortable amount of cash on us. Nathan came back an hour and a half later. They had been unsuccessful. He had not used his full middle name (the way it appears on his passport) so they wouldn’t give him the money. We were a little panicked, but our guide very kindly offered to loan us the money we needed until we could get it worked out. We are very unimpressed with Western Union at this point. The kids and I ran out to pick up food for lunch before we left while Nathan made sure we had all our ducks in a row for the afternoon. We had to leave at 2 to meet the kids at 2:30. We walked down to the little halal noodle shop on the corner, and my faith in cheap and delicious Chinese food was restored! This place runs about $1.50-2.00 per entree, and the whole menu is so accessible! I would eat almost anything on that menu! 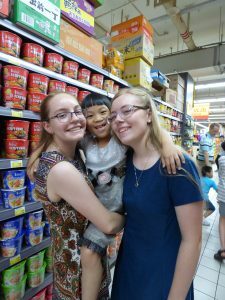 We carried the food home, ate with Nathan, and suddenly the time was upon us – after months of feeling like time was crawling, we were meeting our new kids and it was time to go! We headed downstairs and Helen was waiting for us. As we drove to the civil affairs offices, Helen explained that there was only one other family meeting their child that day, and since Ethan’s city is farther away, we would probably not meet them at the exact same time. We arrived at civil affairs and took the elevator up and all the while, my heart was beating faster and faster. We came in and they said Anna was already there, but we were not allowed to see her until they looked through all our paperwork and determined it was all in order and the fees were paid. As they gave us a few papers to sign, Rinnah whispered to me that Anna was peeking around the corner of a back room they had her waiting in. It’s a surreal moment. And then they told us to stand up and come toward the room and get the camera ready (I appreciated the heads up!) and she walked out toward us. She was dressed up in a very fancy silver dress-up dress that had seen better days, but I think she felt (and was!) beautiful in it. She looked a little blank at first and uncertain, but she let us say hello and hug her and hold her hands. Those first few moments are so unreal because you know that your life and hers has changed forever, but you can’t talk to her, and so you just smile and say hello over and over and pat her back and see what she’s okay with. We’d only been talking with Anna for about 5 minutes when we heard people coming into the office – it was the orphanage worker from Ethan’s orphanage along with him and one other boy, the other boy meeting his family that day too. It was another surreal moment – he walked right past us to the back room (he’d clearly been coached that that was where he needed to go first) but as soon as he saw us, he nodded at us very decisively as if to say, “Yes, you came like you said you would. We’re all set.” Almost immediately they let him come out to us, and we said hello. They told us to sit on the couch in the corner, and I pulled Anna up next to me and she immediately snuggled in by me. She kept looking up at me and every once in a while she’d say, “mama” like she was confirming my identity. Ethan was sitting on the opposite side of her and I just patted his head and his back and he sat patiently and waited to see what was next. It was like he came to us feeling already in the family. He was there, we were there, and he was just waiting to see when we’d take him home. I gave Anna the little dog we brought her and she still looked unsure about what to do with us. Then I gave Ethan the little tiger we brought for him, and he smiled immediately and made it jump around and roar. Anna watched him and it was like it woke her up. She smiled a little and looked at the dog and then at his tiger and then made her dog move a little and she started to relax. They called Nathan back to sign a ton of paperwork. We got out a tiny Lego set we brought and Ethan started putting it together with Toby and Noah. Anna let us know that she was not interested! So I got out these tiny fairy dolls I’d brought and made one fly and suddenly she was smiling too and got down to play with them on the floor with the girls. We played for about an hour while Nathan and I took turns signing paperwork. The Lego was done so we got out the Uno and discovered that Ethan can shuffle like no one’s business. Anna got tired of the fairies and Rinnah discovered that she loved to draw, so they drew pictures together. Anna’s first picture was a beautiful set of clothes in a closet that was apparently outside because there were also lots of pink flowers and two blue, smiling suns. 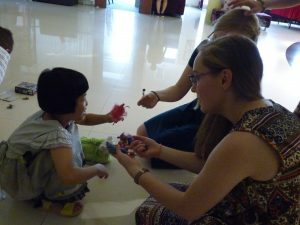 We took pictures for the orphanages and for ourselves, and I got to ask questions about the children from their orphanage representatives. They say, “here’s your child, do you have any questions?” and you think, “Of course I do! I’m sure I have a million questions! I just can’t seem to think of any right at this moment…” and you ask “does she have allergies?” and “how long was he with his foster family?” and you realize you’re going to think of all the questions one minute after the 3 minutes they gave you to do this. Then they said we were done, and we were heading out. We said goodbye to the other family who had been doing the same thing in the other corner of the room, and headed out. Anna by this time was yelling “Jie jie! Mama! Baba!” (Older sister, mommy, daddy!) at whoever was closest and wanted to hold hands with people. Ethan still just seemed like he thought he was where he belonged! Nathan and I just kept looking at each other like, “How could that have gone SO well? It’s not supposed to be that easy!” Most kids are crying or scared or angry. Ours came to us like they knew right away we were family, and it was simply amazing! We went to a grocery store called Carrefour which is like a Walmart in that it has everything. We started upstairs and got Anna a pair of shoes as she only had sandals. We bought plates and cups and napkins for the room and went downstairs and bought food for dinner and breakfast and some snacks. We asked the kids what they liked and they told us. They were excited, but completely appropriate the whole time. Considering what their day had been and the incredible sensory overload in that store, it was astounding! At one point we were in the juice aisle and I said to Ethan, “What do you like? Orange? Apple? Or grape?” pointing to the different juices. He looked at me and pointed saying, “grape” in English. And I said to Anna, “And what do you like? Orange? Apple? Or grape?” and she said “apple.” Then they both just looked at me to see what would happen. So I pointed at Ethan and said, “Grape for Ethan Long Ning” and pointed to Anna and said “and apple for Anna Ru Xuan” and they looked shocked and amazed that they both got one and that it was fair. And then what was amazing to me was that they didn’t ask for anything else, just walked on. We saw books and let them each pick one and it was the same thing – so appropriate when they could have thought it was a free-for-all. We finally got everything and headed back to the hotel. We had dinner in our room because the kids needed to have no more new things that day. Everyone ate well, and no one seemed to have any obvious food issues which is also astonishing as that is so prevalent with kids who are adopted. Nathan helped Ethan take a shower and I gave Anna a bath. Neither objected in the slightest and both looked very excited about their new pjs. When Anna saw her pink socks and underwear, she actually crooned, “oooohhhh! !” And all along they just kept playing with their siblings and looking thrilled with everything. We could hardly believe it! Our four oldest are sleeping in the room across the hall, so we sent them over there and put the new kids to bed in our room, Ethan in a rollaway, and Anna on the loveseat. I didn’t know if they would sleep, especially Anna since I don’t think she’s ever slept alone before. Ethan conked out pretty quickly, but it took Anna a long time – she played quietly with her new dog and Noah’s fidget spinner and finally fell asleep about 2 hours later, but they both slept all night long which was another blessing. At 6 (way before I usually want to be up, but let’s face it, with my friend jet-lag waking me up every night at 2 am and two new kids in the room, I wasn’t sleeping anyway) Anna needed to get up to use the potty. I took her and she led the way back to her bed and pointed at everything to tell me how to tuck her back in. Then she just laid there with her eyes open. I watched her for a bit and then got up and took her dog and held my arms out and said, “come with me?” and she got the hugest grin and jumped up into my arms to get in bed with Nathan and I. We played hide and seek in the covers with her dog which she thought was amazing, and just hung out for about 45 minutes until Ethan woke up. Then he came and got in the bed too and brought his tiger to play with us. We got up around 7:15 to make breakfast and Rinnah walked in our room at 7:30. Anna yelled, “jie jie!!! !” (older sister!) and ran across the room and threw herself into a hug around Rinnah’s knees. I could tell Rin was so touched! A couple minutes later Rachel came in and got the same treatment. This girl loves having older sisters! After a breakfast of bakery bread, quail eggs, drinkable yogurt, and leftovers from dinner the night before, we all got ourselves dressed and headed out to meet our guide, Helen, again down in the lobby. 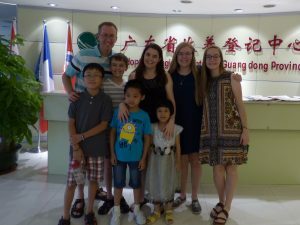 We drove back to the civil affairs office where we needed to sign all the papers to officially adopt Ethan and Anna. They were curious about why the other kids didn’t come, but we explained what was happening, and they were perfectly fine. We got to the office and the other family from yesterday was there too. It turned out that Ethan knows their son – he is only one year younger and they are from the same orphanage. They were from Italy, but spoke enough English that we were able to talk some which is good because my Italian is pretty limited to the vocabulary I used to sing in operas! We signed all the papers with the kids watching every bit of what was happening. Ethan pointed out the American flag in the office. I think he’s excited about going to the US. 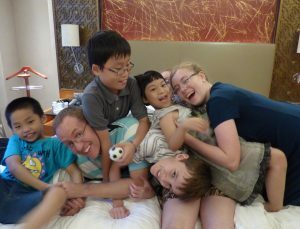 We got back to the hotel room in time to take everyone to lunch at the noodle place again. There was no air conditioning and it was about 95 degrees, so by the end of lunch, the kids were done. I took them back to rest and Nathan headed out again to try to figure out the bank wire that failed. The money aspects of this trip with international banking and carrying cash when that failed were really stressful this trip. We had a low key afternoon with some playground time at the hotel and generally hanging out in the room. Nathan came back and had been able to get the wired money, praise God, so we messaged our guide that we could pay her back in the morning. The Larsons came over with Eddie again for dinner which we just ate in our room. It’s so fun to see how he is comfortable with them already! He clearly loves having a family and I know they love him already! 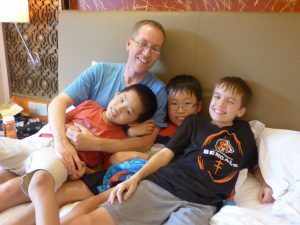 We got the kids in bed that night and they both went to sleep almost immediately – it had been a big day. We are going to Anna’s orphanage in the morning, so we all went to bed to try to get some sleep because that will be an emotional day. This entry was posted on Tuesday, August 1st, 2017 at 10:57 pm	and is filed under News. You can follow any responses to this entry through the RSS 2.0 feed. You can leave a response, or trackback from your own site. Thank you for sharing your experience and keeping us up to date on the progress. We are so excited for you and your family and continue to pray for safety and for the process to go as smooth as possible through the end. I love seeing all the pictures especially the picture of Anna and Nathan!